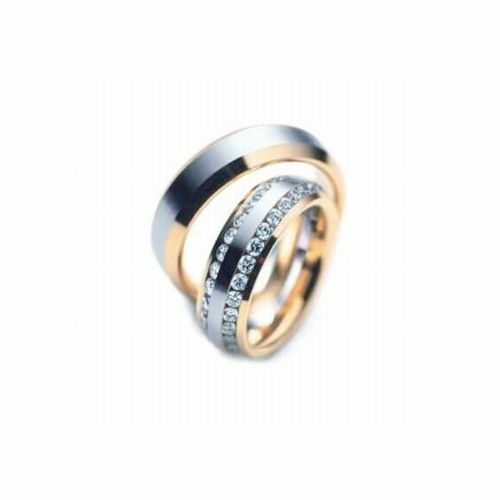 This 18k Gold His & Hers 2.00ctw Diamond Wedding Band Set is 6mm wide and approximately 2mm thick. The bands are rounded on the inside, creating a comfort fit for constant wear that will not pinch and still slide easily on and off of the finger. This beautiful hand made designer wedding band features two yellow gold bands in a shiny finish with a white gold satin finish channel in the center. The HER band features two rows of approximately 27 smaller round brilliant diamonds in each row; approximately 54 total. The diamonds are beautifully placed alongside the white gold satin finish centerpiece, all strategically set in a channel setting. Appropriately named, channel settings consist of diamond set into a channel that is cut into the shaft of the ring. Channel settings can be mixed with other setting methods, and allows for the use of many diamond sizes to create an intricate and beautiful ring. 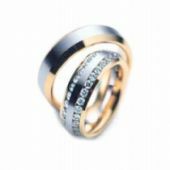 The wedding bands are carefully crafted in 18k gold with a shiny and satin finish detailing the rings. The satin finish creates a soft appearance and gives a smooth appeal to the rings. It complements the appearance of typically plain wedding bands and gives it a unique appeal of elegance.